In a case surely to grab a lot of people’s attention and become a case study in contractor and employee ethics, a Federal Grand Jury indicted 10 current or former upper managers and supervisors at Hanford’s nuclear clean-up site, accusing them of enabling timecard fraud (reported by the Tri-City Herald). One Vice President was indicted on 34 counts, including conspiracy, submission of false claims, major fraud against the United States, wire fraud, violation of the anti-kickback act, and document alteration. A director of the contractor was indicted on 32 counts, a manager was indicted on 34 counts and two supervisors were indicted on 34 counts each. Five other “field” supervisors were indicted on 34 counts each (and also charged with claiming overtime pay for hours they did not work). Earlier this month, the contractor, CH2M Hill paid $18.5 million back to the Government to settle civil and criminal allegations related to this particular timecard fraud. Now the Government is going after individuals. In this case, overtime was voluntary but in order to get workers to volunteer for overtime, the contractor promised them eight hour shifts regardless of how long it took to perform the actual work. Additionally, timecard fraud occurred during regular shifts when it was noted that a “steady stream of workers” began leaving work at 2:30 p.m. for shifts that should have lasted until 4:30 p.m. Typically in cases involving timekeeping irregularities, the contractor pays back some money and perhaps gets suspended or debarred for a short period from new Government contracts. In this case, contractor employees are going to find out firsthand the cost of playing loose with the rules and contravening internal controls. To see the final checklist, click here. More than a year ago, December 5, 2011 to be precise, DoD published a proposed rule to incorporate the concept of a checklist for determining whether a proposal had been adequately prepared. We reported on that proposed checklist here and here and compared it to a DCAA adequacy checklist that had been kicking around for awhile at that time. Adequate proposals, as everyone knows, facilitates their evaluation and negotiation. The purpose for the adequacy checklist, according to DoD, is to ensure offerors take responsibility for submitting thorough, accurate, and complete proposals. The final checklist has only 36 items compared to 47 items in the proposed rule. That's the right direction. Also, just because this new rule appears in the DoD FAR Supplement, doesn't limit its potential applicability. DCAA will undoubtedly pull it out no matter which Agency's proposal they're auditing. But as the checklist pertains to DoD contractors, whenever certified cost or pricing data is submitted, the offerors must complete the checklist and provide it with their proposals (DFARS 252.215-7009). There is also a flowdown requirement for subcontractors to use the same or similar checklist. Comment: Several comments were received regarding the applicability of the checklist to subcontractors as the proposed rule has no guidance on this. One of the respondents noted that flowdown to require subcontractor to use the checklist would add a significant amount of time to proposal preparation. Response: The checklist is not required to flow down to subcontractors, but prime contractors may elect to use it for their prospective subcontractors' proposals. This new checklist applies to solicitations issued after March 28, 2013. Most Government contractors with cost-reimbursable contracts are very familiar with floorchecks - where auditors make surprise visits to contractor facilities to interview employees and assess the propriety of hours charged to Government contracts. On cost-reimbursable contracts, the objective is to ensure that employees charging the contract(s) are actually performing work in support of the contract(s). For Time and Material (T&M) contracts and Labor-Hour (LH) contracts, the audit focus is a little different. The fixed hourly rates are already negotiated. The risk to the Government is that they are getting the skills they are paying for. Obtain a list or roster of employees charging hours under T&M/LH contracts. Gather appropriate background data on the selected employees, such as ID number job classification or category, contractually required labor qualifications, nature of work performed by the employee, and his/her department or cost center prior to conducting the floorcheck. Prepare worksheets to use during the floorchecks to help guide the questioning and facilitate the recording of the employee's responses. Obtain a plant layout and note the selected employees' locations. Identify each selected employee by verifying the employee's ID number and name to the control list or roster. Discuss the nature of the work being performed and observe the actual work performance to determine whether the employee is performing in the proper direct labor capacity (as specified in the contract) and whether the time is being charged correctly. Discuss the employee's timekeeping procedures to determine compliance with internal controls. Compare employee responses with previous data gathered. If inconsistent, ask appropriate follow-up questions. Sometimes, with certain auditors, these questions take on an interrogation atmosphere. It is perfectly acceptable, if this happens, to call a time-out and allow things to cool down. Never underestimate the perceptive and intuitive skills of the auditors. Some of like to think and act like Columbo. Provide a consolidated priced summary of individual material quantities included in the various tasks, orders or contract line items being proposed and the basis for pricing. Most solicitations require pricing by contract line items. Contract Line Items (or CLINs) often contain common material items or service items. So, for example, CLIN number 001 requires 2 units of Part Number ABC, CLIN 002 requires 10 units of Part No. ABC and CLIN No. 003 requires 6 units of Part Number ABC. For purchasing purposes, the contractor will purchase 18 units and the pricing of those units should reflect prices for that quantity. In theory, unit prices drop as quantities increase. If contractors were to price each CLIN separately, the proposed cost might be higher than it would for a consolidated purchase. Failing to estimate prices for combined quantity would probably qualify as an estimating system deficiency and potential billing withhold. It would also result in a lead for a future audit of compliance with the Truth in Negotiations Act (TINA). Neither of these are good. For further information, refer to the DCAA Contract Audit Manual, Chapter 9, Section 9-400 and DoD's Contract Pricing Reference Guide, Vol 3, Chapter 6. There is sometimes confusion concerning whether something or someone is a consultant or a subcontractor. Not only are Government contractors and prospective contractors uncertain about the definitions and status but Government procurement officials are as well. From an "administration" standpoint, there is a great difference between the two. Subcontracts must be solicited, analyzed, negotiated, and administered by the prime contractor much like the Government would handle the prime contract. Consultants on the other hand, only need to comply with FAR 31.205-33 provisions (provide a consulting agreement, work product,and invoice). There is a general rule of thumb to apply when distinguishing between subcontractors and consultants. A subcontractor is hired to perform a part of the prime contractor's statement of work (SOW). Such work might include subsystems, finished parts, or skilled labor to perform specific functions. For example, a base maintenance contractor might subcontract barracks painting requirements to a painting company. Or, an aircraft manufacturer might subcontract the avionics portion of a contract to a company that specializes in avionics. Consultants are not usually hired for a specific contract or to complete a portion of the prime contractor's SOW. They are often subject matter experts whose expertise is not tied to a single contract. FAR Definitions. The Federal Acquisition Regulations (FAR) have a few definitions that will help clarify the difference between subcontractors and consultants. FAR 3.502-1: Subcontractor (1) means any person, other than the prime contractor, who offers to furnish or furnishes any supplies, materials, equipment or services of any kind under a prime contract or a subcontract entered into in connection with such prime contract and (2) includes any person who offers to furnish or furnishes general supplies to the prime contract or a higher tier subcontractor. FAR 3.1001: Subcontractor means any supplier, distributor, vendor, or firm that furnished supplies or services to or for a prime contractor or another subcontractor. FAR 31.205-33: Professional and consultant services ... means those services rendered by persons who are members of a particular profession or possess s special skill and who are not officers or employees of the contractor. Examples include those services acquired by a contractor or subcontractor in order to enhance their legal, economic, financial, or technical positions. Professional and consultant services are generally acquired to obtain information, advice, opinions, alternatives, conclusions recommendations, training or direct assistance, such as studies, analyses, evaluations, liaison with Government officials, or other forms or representation. A fundamental requirement for billings under cost-reimbursable contracts is that claimed costs must be reconcilable to a company's cost accounting records. A lot of companies, when they're first starting out in Government contracting, do not fully understand this. They might bill their proposed hourly rates, or proposed indirect expense rates. They might bill budgeted hours rather than actual hours. We've even seen cases where contractors have billed a pro-rata share of the negotiated costs (total negotiated cost divided by the period of performance in months). Under cost-reimbursable contracts, the Government has agreed to reimburse contractors for their actual costs (up to a certain limit) and that means contractors must have accounting systems that accumulate actual costs (by contract). The accounting system then must feed the billing system and the two must reconcile. "Reconciling" and "Matching" are two different things. Billings and accounting records do not need to match. They only need to be reconcilable to one another. There are many reasons why billings might not match the accounting records. Auditors refer to these differences as "reconciling items". Differences that cannot be reconciled however, lead to audit issues which often lead to delays in processing payments. Delays impact cash flows. Unallowable costs under FAR, agency FAR supplements, and contract terms. Costs that are non-billable because the costs do not meet specified criteria for inclusion (e.g. accrued material costs that ordinarily will not be paid within 30 days). Costs in excess of ceilings or other limitations. Use of approved billing rates that differ from a contractor's "applied" rates. Costs that require specific contracting officer approval before they can be incurred or billed (special purchases, overtime authorizations, etc.). It you have a cost-type contract, you will be audited somewhere down the line. One of the first exposures after contract award will be an assessment of the billing system, procedures, and practices. Contractors need to be prepared to explain any differences between billings and the accounting records. The Meaning of "Final Payment"
Our February 11th blog posting discussed record retention requirements for Government contractors. Essentially, contractors are required to maintain books and records supporting costs incurred/claimed/billed on Government contracts for three years after final payment or a shorter period as specified in FAR 4.7. You can read that posting here. Today's posting focuses on the meaning of "final payment". While DCAA and DCMA will usually consider that "final payment: occurs when the contract is closed, contractors often consider that final payment occurs when the Government pays the invoice just after the work is completed. Unfortunately, because DCAA is so far behind in auditing incurred costs, years can elapse between those two dates. While the guidance is far from clear, we take a conservative position and recommend that contractors maintain their books and records for three years following contract closeout, unless, of course, those books and records fall under one or more of the exemptions found in FAR 4.705. However, we understand why many contractors believe a shorter retention is appropriate. The "exception of items usually reserved for future determination and settlement are further defined as insurance, warranties, sales taxes, patent royalties, claims on appeal, and similar items. Records for these items must be maintained until "finally determined". Well, this listing doesn't specifically include final determination of direct and indirect costs but there is that catch-all phrase; "and similar items". Since costs on a cost-reimbursable contract are not finally determined for (i) indirect costs until the Government (usually DCAA) and the contractor sign a final rate agreement and (ii) directs costs are not finally determined until final acceptance by the Contracting officer, it seems logical to conclude that these "items reserved for future determination and settlement." The Defense Base Act of 1941 provides workers' compensation protections to employment outside the United States when working for private employers on U.S. military bases, when working on public works contracts (construction and service contracts), or when working on foreign assistance contracts funded by the U.S. It is intended to provide disability compensation and medical benefits to covered employees for work-related injuries, and death benefits to eligible survivors of employees whose deaths are work-related. Contractors and subcontractors working overseas are required to purchase workers' compensation insurance or to qualify as a self-insurer. They are also required to submit timely, written reports to the Department of Labor (DOL) in the event of an employee's injury or death, to make timely payment of all compensation due for disability or death, and to submit a timely, written report of such payment to the DOL. Contractors should check to see if their contracts contain the FAR 52.228-3 clause, Workers Compensation Insurance (Defense Base Act). If so, there are some very specific requirements. One that many contractors fail to comply with is the requirement that it must have insurance (either purchased or self-insured) before it begins work on the contract. It also requires that the contractor keep the policy in force until contract performance is completed. Another provision of this clause that is often overlooked is the requirement to include the clause in all subcontract to which the Defense Base Act applies. A listing of contracts to which the clause applies is found in FAR 28.309. Essentially, if the prime contract contains the clause, most likely subcontracts under that prime are covered as well. When it comes to Congress's efforts to set arbitrary compensation caps, the line from an old Gordon Lightfoot song, "I'd rather press on, I don't want to rest easy" really applies. Government contractors dodged a bullet when a $231 thousand cap (equal to the Vice President;s salary) was struck from the final 2013 NDAA (National Defense Authorization Act) and replaced with a "study" to determine the impact that such a cap would have on contractors. Not willing to wait for the study's results, three Senators (Boxer, Grassley, and Manchin) are working to get compensation caps put into current appropriations acts. They've got a point. The current cap of $763 thousand is a lot of money and almost double the President's salary. They're also playing the sequestration card - "we're about to furlough Government workers but we're still paying big bucks to contractors". The problem is that no one really knows how much money we're really talking about. Just because there's a cap out there, doesn't mean that contractors are paying their employees anywhere near that amount. Compensation must still meet the requirement for reasonableness (commensurate with the services performed). No one has the ability to access a database and calculate the impact to the Government if the cap were lowered to $400 thousand, or $231 thousand, or even $200 thousand. Industry groups, such as the Professional Services Council (PSC), have come forward to argue that everyone should relax a little and let the GAO (Government Accountability Office) finish their study on the matter. It should be noted that current and proposed compensation caps do not limit what contractors can pay to their employees. The caps only limit what contractors can seek reimbursement for under their Government contracts. Back in June 2011, someone called GAO's (Government Accountability Office's) "FraudNet" Hotline and reported that a Government contractor was enhancing its profits by forcing employees to stay in cheaper hotels than the lodging rates that were proposed and negotiated. According to the DoD-IG report that was just published, the contractor had negotiated rates base on the maximum rates published in the Joint Travel Regulations, following FAR 31.205-46 that sets such a limit. However, when it came time for employees to travel, the contractor required employees to stay at hotels charging far less than the maximum per diem rates. The practice allowed the contractor to pocket the difference, thereby enhancing its profits on the contract. The DoD-IG did not substantiate the allegation. For the most part, the task orders identified by the relator were not fixed-price as was alleged, but were cost-type and the contractor had billed the Government for only the actual cost of travel, as was required. On the one task order that was fixed-price, the DoD-IG had no visibility into the detail of the billing - there was no requirement that the contractor separately identify travel costs. We bring this up for its application to estimating systems. While it is true that FAR 31.205-46 limits meals, lodging, and incidental expenses to the rates prescribed in the Joint Travel Regulations (JTR), the overriding requirement on negotiated contracts is that the cost or pricing data be based on current, complete, and accurate information. If you've got special deals with hotels and airlines, you need to disclose that information in your proposals. When evaluating proposals, DCAA or DCMA will usually investigate history to help determine the propriety of proposed costs. If these organizations find that historical costs were not considered but should have been, they will impact proposed costs accordingly. Additionally, they may also cite an estimating system deficiency because of the contractors failure to disclose current, complete, and accurate cost or pricing data. (Estimating deficiencies can lead to contract withholds). Just because FAR sets "maximums" for some costs, doesn't mean that contractors can or need to propose those maximums. TINA (Truth in Negotiations Act) requires contractors to propose current, complete, and accurate costs. If projected actual costs are lower than these maximums, contractors must propose the lower amounts. Why Do DCAA Audits Seem to Go On Forever? Many contractors have complained to us about the protracted duration of DCAA audits. There is no doubt that audits conducted today are much more in depth than they were a few years ago. On the other hand, DCAA is addressing "risks" differently so that fewer audits are being performed then previously. For example, small contractors with less than $15 million of cost incurred under cost-type contracts have only a one percent chance of being selected for audit, if previous audits were "clean" or had only minor exceptions. That said, there are still some audits out there that leave us scratching our heads over the depth of audit analysis being performed. Take billing rates for example. Not too long ago, DCAA reviews of billing rates were rather perfunctory, especially at very small contractors. The risk to the Government was considered very low as provisional billing rates are typically adjusted to actual rates at year-end. The only damage to the Government, if the rates were too high was the time-value of money for a short period of time, usually less than a year. Presently, there are reviews of billing rates going on at very small contractors that are approaching two months in duration and who knows how many hours expended. Time needed to prepare draft audit reports and address any management review comments (a very significant factor these days, given the attention that GAO and the DoD-IG on the quality of DCAA audits). So, if you're feeling picked on these days, rest assured that you have not been singled out and you are not alone. 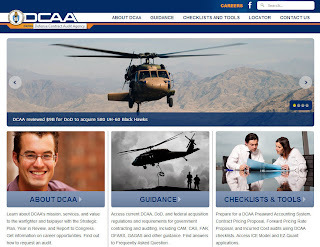 Click here to see DCAA's newly revised website. 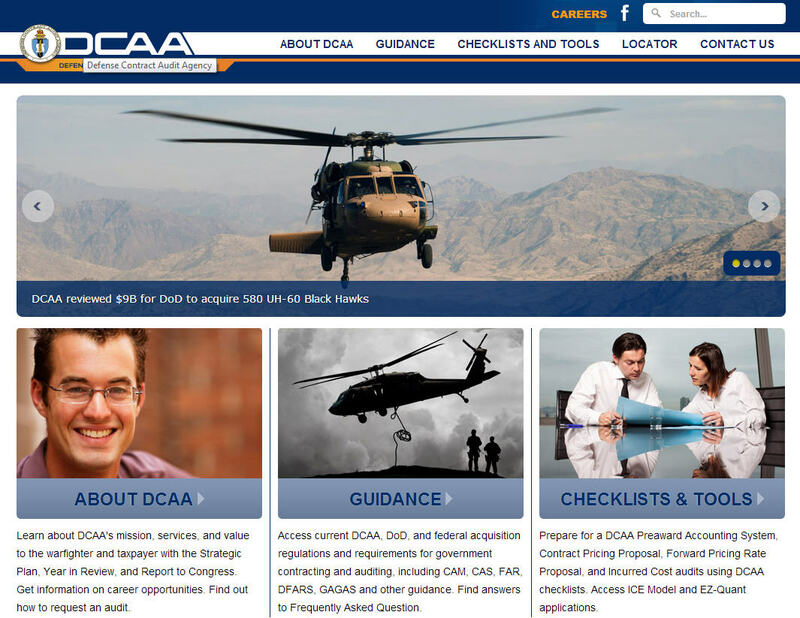 After more than seven years, DCAA rolled out a fresh looking website. Our quick perusal of the website didn't find too much that is new. Its basically repackaged information that was there previously. We did find a couple of new items (at least new to us). There a FAQ (Frequently Asked Questions) for contractors that covers many of the misconceptions that contractors and prospective contractors have about DCAA's services (don't call us, we'll call you). It would have been nice for this to have been integrated into the website rather than a .pdf document. There also a new report on DCAA activities called 2012 Year In Review, which, if a contractor published something similar, would probably be considered unallowable advertising. Other that those two items, we didn't see anything that wasn't there before. You can still find the DCAA audit programs, its Contract Audit Manual (CAM), recent audit guidance, and a host of checklists and links to other sites for FAR, DoD FAR Supplement, Cost Accounting Standards, etc. Oh yes, and if you want to go work for DCAA, they've included at least three links on the home page to their "Career Center". The Defense Contract Management Agency (DCMA) released a new application for use by the Department of Defense procurement community. They call it the Contract Business Analysis Repository (CBAR) and is mandatory for all contracts greater than $25 million. Information about costs and financial condition of the parent entity of major corporations. CBAR will also capture PCO (Procuring Contracting Officer) business clearance data prepared to support the negotiation and award of a contract pricing action. The purpose of the business clearance information, according to the Government, is to enable contracting officers to share negotiating experiences with other negotiators. Sharing experiences should result in better preparation for negotiating subsequent contracts and realizing a better deal for the Government. Among the data collected in CBAR's business clearance module is a comparison of proposed and negotiated costs as well as several comment fields to describe experiences. Since this is a new requirement tacked on to the already overworked contracting officer corps, it seems unlikely if contracting officers take the time to write up any narrative description of their negotiation experience. Most likely, data entry will be limited to only the most basic of information. The CBAR is not public information but we recommend that contractors periodically consult with their contracting officers to review the information pertaining the them. Data in these kinds of databases tend to get stale and it is important to ensure that the information is accurate. Last week, the Department of Justice (DoJ) announced a settlement in which CH2M Hill Hanford Group (CHG) admitted to federal criminal violations by engaging in widespread timecard fraud over a ten year period. In order to resolve CHG's civil and criminal liability, CHG agreed to pay a total of $18.5 million, commit an additional $500 thousand towards accountability systems, consent to a corporate monitor, and to continue to actively cooperate with the ongoing fraud investigation. There are many fascinating aspects to this case. First, the discovery of the fraud came from a whistleblower who himself, had engaged in the fraud (however, the whistleblower was not allowed to share in the recovery). The discovery did not come from any Governmental oversight even though the Government spent untold thousands of hours auditing CHG's contracts. The Defense Contract Audit Agency was on-site, so was the DoE Inspector General, and so were DoE's financial analysts. Makes one wonder whether the audit risks were properly identified. Secondly, it seems like the employees were controlling the supervisors and managers. Employees were refusing to work overtime unless they were guaranteed eight hour shifts. As stated in the agreed statement of facts, the inability of CHG's upper management to secure the necessary overtime volunteers for various jobs threatened CHG's ability to complete various projects linked to performance incentives. This in turn threatened CHG's ability to earn certain fees, and therefore profits under the contract. The inability to obtain performance based incentives would have directly impacted the personal corporate bonuses of certain members of CHG's upper management. Consequently, these upper management folks as well as direct supervisors of the hourly workers and other supervisory personnel, accepted the practice of hourly workers only working until the particular overtime job was completed, leaving the project site but falsely claiming a full eight hours even when the job took less than eight hours. One would think that under normal circumstances, employees' refusal to work overtime would be a cause for separation. But, Hanford workers have a very strong union. Every few years, DoE brings in a new contractor to oversee the nuclear clean-up effort but all the incumbent employees keep their jobs. Thirdly, the DoJ press release makes no mention of any consequence for the fraud committed. No one was fired, no one went to jail, no one, except the corporation, paid a fine. There was not even the proverbial slap on the wrist. In fact, the press release stated that there was no discipline, formally or informally. What kind of message does that send? As we've stated here many times, contractors must have strong ethics, core values, and codes of conduct. It begins at the top and must permeate the entire organization. It is pretty obvious from the DoJ press release that top management knew the fraud was ongoing but rather than stop it, allowed it to continue in order to pad their own pockets. Late last week, the DoD Inspector General's office (DoD-IG) issued their long-awaited and long-delayed audit report on audits conducted by DoD's Contract Audit Agency (DCAA). Perhaps you read about it already - it made some news. We haven't read the entire 100 page report and if we get around to it, we may want to provide additional coverage here in this blog. In the meantime, we have a couple of observations regarding this report. This stuff is very old. The DoD-IG reviewed 50 reports issued in Fiscal Year 2010. Much of the actual audit effort was performed earlier than that. Many were begun in Fiscal Year 2009 which means that work could have begun as early as October 2008. The DCAA of 2013 is not the same as the DCAA of 2008, 2009, or even 2010. A lot of changes have occurred - new leadership, revised policies, more rigorous quality control, and significantly more time allocated to each audit. Someone should ask how DCAA is doing today, not how it was doing four or five years ago. Perspective. The DoD-IG found deficiencies in 37 of 50 reports. Big deal. Give us a few years with 50 reports and we could find some kind of deficiency in all of them (including our own). But what is the significance of those deficiencies? Do they rise to the level where the overall audit conclusions and recommendations are invalid? So, if an auditor finds that a contractor is has poor timekeeping practices (e.g. employees do not complete their timesheets in a timely manner), does it matter to the overall finding that the auditor did not document supervisory discussions? Someone needs to put these deficiencies into perspective. Impact on taxpayers. DCAA audits are advisory to contracting officers. The contracting officers use the information to make decisions, negotiate contracts, and ultimately, ensure that taxpayer dollars are well-spent. If the contracting officers do not have confidence that DCAA's reports are any good, they won't be sticking their necks out to support the audit position. Even now, there is doubt among contracting officers over whether DCAA audit reports have merit. Why cast additional doubt on the veracity of audit positions/recommendations when such doubt is not merited? Contractor Defense. The first thing a contractor is going to ask when presented with a DCAA audit report with findings is what steps has the contracting officer taken to ensure that the DCAA audit findings are valid, responsible, proper in the circumstances, and whether the audit was "adequate" - i.e. based on the application of Generally Accepted Government Auditing Standards - or whether the report were such that if the DoD-IG reviewed it, would recommend that it be rescinded. In other words, contractors will undoubtedly use this DoD-IG report to cast doubt on the validity of future DCAA reports. You can read the entire DoD-IG Audit Report here. The SBA processes about 500 size protests each fiscal year. These protests are usually filed by firms against their competitors who are suspicious that the competitor is too big to bid on a particular solicitation. Of those filed, 41 percent are determined to be small, 26 percent are determined to be other than small, and the rest are dismissed on procedural grounds. This is a very small percentage of the 341 thousand small business firms registered in the System for Award Management (SAM). Although small in number, the process of filing and adjudicating a size protest is cumbersome, time consuming and often does not allow the Government sufficient time to complete their investigation. Everyone recognizes that the process needs to be improved. Earlier this week, DoD, GSA, and NASA (i.e. the FAR Councils) published a proposal to amend the FAR (Federal Acquisition Regulation) to revise the small business size and small business status protest and appeal procedures to ensure that contracts set-aside for small businesses are awarded to eligible small business concerns. These proposed regulations also apply to various degrees to appeals of HUBZone small business concerns, service-disabled veteran-owned small business concerns, economically disadvantaged women-owned small business (EDWOSB) and women-owned small businesses (WSOB). Increase the amount of time the SBA has, after receiving a protest, to make a size determination of a protested concern from 10 to 15 business days. Clarify that the contracting officer has the authority to extend the amount of time needed by SBA to make a size determination. Clarify that it is within the discretion of SBA's Office of Hearing and Appeals to accept an appeal from a size determination, and, that SBA may at its sole discretion, reopen a formal size determination to correct an error or mistake, if it is within the appeal period an no appeal has been filed with OHA. Allow the contracting officer to consider whether contract performance can be suspended until an OHA Judge renders a decision, when a post-award appeal is submitted to OHA within the required timeframe. If a protest has been sustained and the concern was determined to be ineligible as an SBD, SDVOSB, HUBZone, EDWOSB or WOSB, what must happen before the concern can represent itself under one of these small business categories. Some government contracting specialists expect the number of appeals to increase as more and more firms chase a dwindling pot of contracting/grant dollars. An amazing story appeared earlier this week in a San Diego newspaper about Government contractors and bribery. It wasn't the bribery that was amazing - we read and hear about that all the time. The amazing part was the lack of Government oversight over the work and practices of its contractors allowing corruption to go undetected for eight years. It would probably still be going on if not for an anonymous hotline tip. Based on this news story, the Navy put a contractor in charge of writing Navy contracts. Then, the same guy that wrote, evaluated, and negotiated the contract was able to make purchases under the contract (ostensibly for the Navy's use). One really has to marvel at the lack of internal controls built into that system - a contractor to the Navy, issuing contracts to other Navy contractors and then makes purchases under the contract he just issued. This violates a fundamental segregation of duties internal control principle. During the trial, the defendant tried blaming the Navy noting that the scheme went undetected for years. Perhaps the Navy should have discovered it sooner but that doesn’t justify fraud and the jury didn’t buy the argument. No one really knows how much taxpayer money was lost. Investigators turned up $4 million in fraudulent billings of which $1 million went back to the two men that orchestrated the fraud in bribes. Probably, as in most of these kinds of cases, this was only a fraction of the real taxpayer loss. Based on our informal survey of a number of Government contractors, there has been no specific contracting officer guidance yet on what to expect or plan for concerning the sequestration. Everyone is just cautiously waiting. Most companies expect sequestration to have some impact on existing and future workload but at this point, its business as usual. At this time, the Department of Energy is asking every step to mitigate the effects of these cuts. However, the Department may nevertheless need to take certain actions with regard to particular contracts and assistance agreements in order to comply with the required budget cuts. For procurement contracts, the Department of Energy may decide not to exercise an option or may need to negotiate lower prices or other terms via a bilateral modification to meet the constraints imposed by sequestration. The Department may also determine it necessary to stop or suspend work, reduce the scope of work, or partially or completely terminate your contract for convenience. Additionally, planned contract actions for new work may be re-scoped, delayed, or canceled depending on the nature of the work and the degree to which it directly supports the agency's mission goals. For financial assistance agreements, the Department may decide not to issue a continuation award - including not awarding incremental funds on multi-year awards - and may require negotiation of a reduction in the scope of your award. To the extent that your contract or financial assistance agreement is affected due to these budget cuts, you will be contracted by the appropriate Contracting Officer with additional details. Thank you for your continued partnership with the Department of Energy, and for your cooperation as we work together to manage these unfortunate circumstances. We don't know how DOE and contractors are going to work together to manage the sequestration circumstances. It seems to us that all of the decisions will be DOE's. Last week, two congressional representatives introduced a bill that, if enacted, will reduce the total number of federal civil service employees through attrition (see H.R. 824, The Federal Workforce Reduction Through Attrition Act). Basically, this Act would allow federal agencies to replace only two thirds of the number of employees leaving the federal service until the total federal workforce totals 90 percent of the number of employees as of September 30, 2012. The law expires once that target is achieved or on September 30, 2015, whichever comes first. After that, the Federal Government could presumably go on a hiring binge. The Act contains provisions where the President can waive the rules if there's a war or a natural disaster or some other unforeseen event. And, lest you contractors out there think might be a good deal because Agencies will go out and hire contractors to do the work that civil service employees were doing, the Act specifically states that there will be no increase in the procurement of service contracts by reason of the enactment of this Act. Finally, the Act would require OMB (Office and Management and Budget) to monitor Agency progress and submit quarterly reports to Congress. There are about 2.2 million civil service employees (give or take, depending upon what source is used). Reducing that number to 90 percent would result in a reduction of 220 thousand jobs. Last week, the U.S. Attorney's office in Anchorage, AK issued a press release, announcing that an Anchorage woman was indicted by the federal grand jury in Anchorage for violating conflict of interest laws. According to the indictment, the woman was an auditor with the Department of Defense's Defense Contract Audit Agency (DCAA) from January 2003 to September 2006. During that time, she was the primary auditor of cost proposals, labor rates and claims for the Missile Defense Agency (MDA). The MDA is the agency that develops, tests, and fields the ballistic missile defense system for the U.S. In September 2006, the auditor left DCAA and whet to work for Alaska Aerospace Corporation (AAC) as its controller. AAC was established in 1991 by the State of Alaska to develop a high technology aerospace industry in the state. AAC became a contractor for MDA in 2003 with a five year contract to provide support for launches from the Kodiak Launch Complex in Kodiak, Alaska. The indictment alleges that in July 2008, the former auditor represented AAC during communications and negotiations with her former Government employer, DCAA, about the same MDA contract she had previously audited, with the intent to influence DCAA about that contract. This representation, according to the indictment, was a violation of a lifetime restriction which barred such communications. The maximum penalty for violating the conflict of interest statute, which imposes a permanent restriction against communicating on behalf of another on a matter in which the person participated personaly and substantially as a government employee is up to five years in prison and a $250 thousand fine. An arraignment date has been set for later this month. We've always known intuitively that the costs associated with complying with CAS (Cost Accounting Standards) was expensive and time-consuming for contractors. Now we have a Government estimate of the cost for complying with just one small aspect of CAS - reporting changes in cost accounting practices. FAR Subpart 30.6 and the provision at 52.230-6 include pertinent rules and regulations related to the Cost Accounting Standards (CAS) along with necessary administrative policies and procedures. These administrative policies require contractors with CAS covered contracts to submit cost impact estimates and descriptions in cost accounting practices and also to provide information on CAS-covered subcontractors. a general dollar magnitude or detailed cost-impact proposal of the change which identifies the potential shift of costs between CAS-covered contracts by contract type (i.e. firm fixed-price, incentive cost-plus-fixed-fee, etc.) and other contractor business activity. Recently the Government attempted to estimate the cost of complying with this provision. Based on consultation with a Government subject matter expert (SME) they estimated that it would take the average contractor 175 hours to prepare and submit these accounting practice changes and the related cost impact and that the average contractor would be expected to submit 2.27 responses per year. That works out to about 400 hours per year per contractor.